Love the Grinch! And I still have never read A Christmas Carol. I've seen the plays and movies but I need to read the book at some point! I'm with you on the Harry Potter -- I re-read the series for the first time during Christmas break, and I always think of the series in terms of going back to school and the coming of winter. I like thinking of Harry and Ron playing Wizards' Chess and roaming freely around the castle in the first few books. I couldn't really think of Holiday books, so I went with holiday movies instead. That was much easier. haha. But I do have to agree with the ones you picked. Harry Potter is one of those series that's great whenever, but they seem to be even better in the winter. Maybe it's the cold weather, gray skies, and hot cocoa that gives the books that extra something. I agree with you for Harry Potter. I am more The Lord of the rings type, but the idea is the same : to go far far away, in a place with wizards and a very evil enemy ! Mine all turned out to be children's books. I haven't read a good Christmas book in forever! To me the Grinch that Stole Christmas is a classic must read for the holidays. 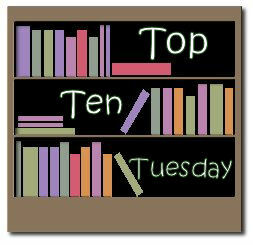 Here's my list of Top Ten Books to Read During the Holidays. I could have easily made a Top Fifty Books for this list! That Mary Higgins Clark does sound like fun! Great list! I also put Grinch on my list. And you've given me some lovely ideas for holiday books. The Grinch is my top one as well! What is next week's meme? Could you give me the link to post where all the upcoming memes was posted? Thanks. I agree-the first time Harry has a real Christmas in book one was a wonderful holiday moment! Thanks again for hosting :) This was a tough one for me, so I threw in some holiday movies, too. Okay, somehow my thing went on the list twice as I realised that I'd typed my blog name wrong but accidentally entered it again :P Anyway, great idea for a list, made me really think about the books that I read at Christmas - not all of them are technically Christmas-themed but do make me think about the holidays for some reason. I love a Christmas Carol, too. But, I am with you...it's hard to think of books! I'm morally opposed to reading anything whatsoever by Glen Beck. Haha. Great list though! This was a really fun Top Ten. Thanks for hosting!! Glad to see that I'm not alone in coming up with ten holiday books! Ingrid- Like I said, don't let who the author is stop you, don't look at his political or religious standpoints. The book is a real gem. I don't like the book of A Christmas Carol for some reason: I like Charles Dickens' other works. I haven't read The Grinch Who Stole Christmas, but maybe I'll get around to it this year! Jumping in late...with my own little mystery twist on the Holiday books. I totally get in the mood for the Harry Potter books and movies this time of year. Great list topic. Just in time to get us in the Christmas swing.